OHIO VALLEY — Though a river may separate them, Mason, Meigs and Gallia counties pulled their resources to come together on Tuesday to connect potential employees with employers from across the region. The inaugural Ohio Valley Regional Job Fair was organized by the chambers of commerce of Mason, Meigs and Gallia counties, with assistance from the offices of U.S. Congressmen Evan Jenkins (R-W.Va.) and Bill Johnson (R-Ohio). 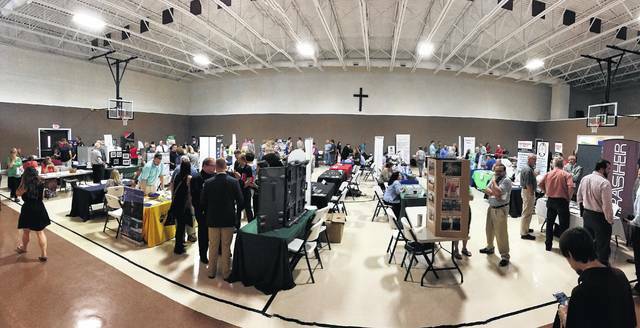 “A good job solves a lot of problems,” Jenkins said while attending the event which saw around 60 potential employers and educational organizations set up at Trinity UM Church’s Christian Community Building in Point Pleasant. 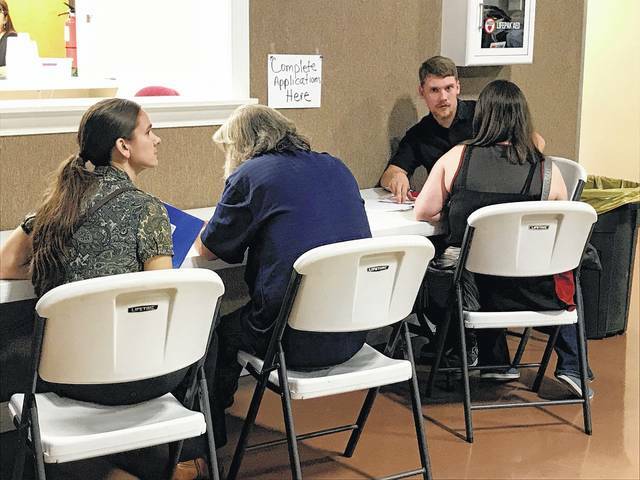 “This is about not only finding a good job but identifying a path to one,” Jenkins said of the job fair, saying he was told this was the first job fair of its kind held in Mason County. The turnout seemed to reflect this, with a steady flow of people into the venue. Johnson also remarked on the turnout at the event, saying it was indicative of a population who wants to work and find a good job. Both Johnson and Jenkins said they’d hosted job fairs in other areas of their districts prior to the one on Tuesday and hoped to continue those efforts in this area. Both men often work together in Washington on similar issues affecting their districts, they added. “The river doesn’t divide us when it comes to helping people,” Jenkins said. 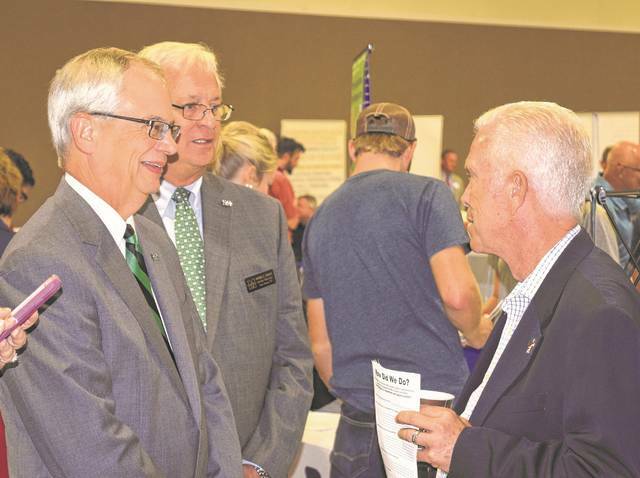 “Such a good turnout,” Hilda Austin, Mason County Area Chamber of Commerce director said, echoing Jones’ sentiment that she hoped it wouldn’t be the last regional job fair. “Based on the success so far, I’d love to continue this partnership in future years,” Michelle Miller, director of the Gallia County Chamber of Commerce said, adding she enjoyed working with her counterparts in Mason and Meigs in endeavors which benefited the entire region. “It’s nice to have the three counties working together and to have the congressmen involved as well,” Whitney Thoene, director of the Meigs County Chamber of Commerce chimed in, adding she was impressed at the representation of local employers from across the tri-county. Of course, at the end of the day, the job fair was about connecting people with jobs and information – both of which are powerful tools. Cole Simpson of Gallipolis was one of those job seekers and though he didn’t leave with a job, he picked up multiple applications. “I found a lot of interesting information,” Simpson said. Around 60 potential employers and educational organizations set up at Trinity UM Church’s Christian Community Building in Point Pleasant on Tuesday for the Ohio Valley Regional Job Fair. Attendees at Tuesday’s regional job fair organized by the Mason, Gallia and Meigs chambers of commerce. Marshall University President Dr. Jerome Gilbert, far left, and MU Mid-Ohio Valley Center Director Homer Preece, at center, share a moment with U.S. Congressman Bill Johnson (R-Ohio) at Tuesday’s job fair. From left, U.S. 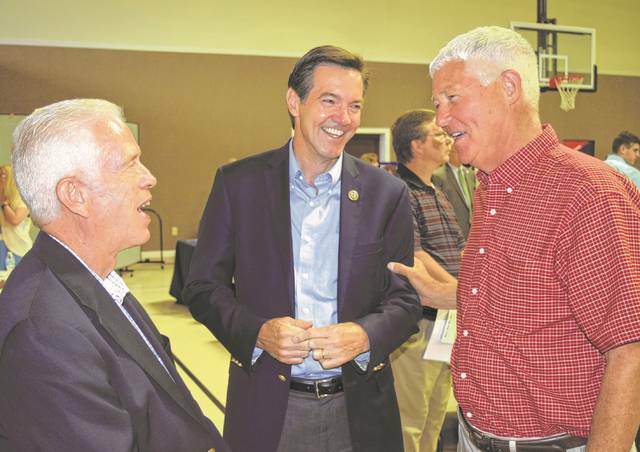 Congressmen Bill Johnson (R-Ohio) and Evan Jenkins (R-W.Va.) speak with Mason County Commissioner Rick Handley at Tuesday’s job fair. In addition to Handley, Commissioners Tracy Doolittle and Sam Nibert were also in attendance.